You will use the Salesman File to keep a file of all of the salespersons you employ. There are many places in the Accounts Receiv­able package where this file is very useful. Here are a few of them. When sales transactions are processed, the amount of the commission to be paid to the salesperson is recorded in the Commissions Due file. Later on, you can print the Commissions Due Report which details what commissions are due each salesperson. To make this type of reporting possible, it is necessary for you to enter during Sales & CR/DR Memo Processing the number of the salesperson responsible for the sale. The Salesman record will then be obtained from the Salesman file and the salesperson's name will be displayed so you can ensure that you have entered the correct salesperson number. 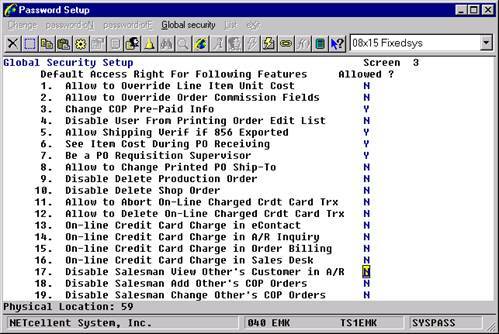 The Salesman file will also be used in the Customer Order Processing package. When customer orders are entered, you also enter the number of the salesperson responsible for the sale. 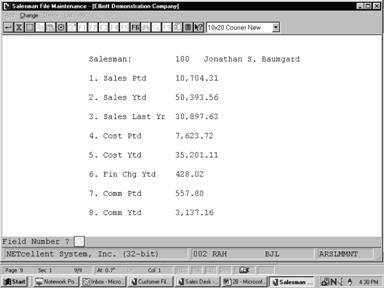 The Customer Order Processing programs can calculate the commission due the salesperson, using the table of customer types and commission percents that you enter as part of the data for each salesperson. This is done by looking through the table for a customer type which matches the type of the customer whose order you are processing. If a matching customer type is found, the corresponding commission percent is used to calculate the amount of commission the salesperson is to receive. This information is then passed from the Customer Order Processing package to the Accounts Receivable package. Customer Order Processing has the ability to calculate commission by item based on data in Customer Order Processing Setup and the Inventory Maintenance Item file. The amount of sales that the salesperson is responsible for is stored in each Salesman record, so that the Sales Analysis by Salesman Report can be produced. This report will allow you to see what percen­tage of total sales is being contributed by each salesperson. When you are entering customers into Elliott, you will be requested to enter the number of the salesperson most usually associated with each customer. This entry will be the default salesperson used by other applications. That is, when other programs ask you to enter a salesperson number, those programs will know who the usual salesman is and will be able to show you that salesperson number and allow you to select it easily. You will also be able to enter some other salesperson number in place of the default salesperson number, if you should wish. Enter the number you want to represent the salesperson. This salesperson number can contain alphanumeric characters as well as purely numeric digits. For example, you might make your salesperson numbers something easy to remember, like Bob or Jan. Or, you might use the salesperson's initials as the salesperson's number. On the other hand, you might just want to use numeric salesperson numbers like 100 or 250. In the change or delete mode, press the F7 key to search by the salesman number. 30 alphanumeric characters. Lower case letters are allowed. Two lines of 30 alphanumeric characters are allowed for entry of the salesperson's address. Enter the salesperson's phone number. Twelve characters are provided so that you can enter hyphens into the number if you wish. For example, 614‑382‑5999. Lower case letters are allowed. Enter the territory that the salesperson is responsible for. Enter an e-mail address, if applicable. Neither the salesperson's initials nor his territory are used by any programs in the Accounts Receivable package at this time, but if you want to put them to some use they will be available to you in the file. These fields do appear on the Salesman File List for your reference. The next several fields on the screen are a table of customer types and commission percentages. These fields are used in the Customer Order Processing package to calculate the amount of commission that is due a salesperson as the result of a sale. 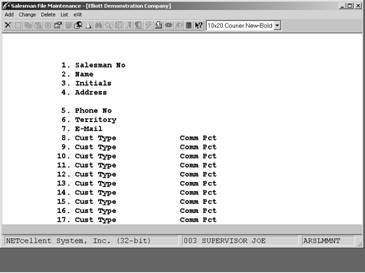 The programs look through this table of customer types for a matching customer type of the customer whose order is being processed. If a matching type is found, the corresponding commission percent is used to calculate the commission amount. You will still be given the opportunity to override this commission percentage and enter some other value, if you should desire to do so. Enter the customer type to be used in calculating a salesperson’s commission as explained above. Any blank customer types that you enter will be removed from the table of customer types before the record is stored in the Salesman file. So, if you are changing a Salesman record and want to remove an entry from the table of customer types, just change the customer type to blank. 5 numeric digits with 3 decimal places (99.999). Enter the commission percent, which corresponds to the customer type on the left, to be used in calculating the commission amount as explained above. 11 numeric digits with 2 decimal places and an optional minus sign (999,999,999.99-). Enter the amount of the sales­person's sales so far this period. Enter the amount of the salesperson's sales so far this year. Enter the amount of the salesperson's sales for last year. Enter the cost of the sales the salesperson has made so far this period. Enter the cost of the sales the salesperson has made so far this year. Enter the amount of finance charges the salesperson has incurred so far this year. Enter the amount of commissions the salesperson has earned so far this period. Enter the amount of commissions the salesperson has earned so far this year. The fields entered on screen 2 of Salesman File Maintenance are updated every time sales transactions are processed. They can be cleared to zero using the Clear A/R Accumulators application. For this reason, the operator will ordinarily not be able to change these fields in change mode. When these fields are displayed, this message will also be displayed. Changes To These Fields Not Allowed Press "Return"
However, if you do find it necessary to make corrections to data that was entered in error, there is a way to do it. When the above message is displayed, press Control-O to overwrite the value. You will then be able to make changes to these fields in the same way as any other fields are changed, provided you have answered the change protected fields question in A/R Setup as Y. 1. Identify the user as a salesman in Password Setup for that user. If you leave the Salesman No blank, then it implies this person is not subject to salesman security. (For example, this maybe an accounting person who needs to access all salesman records). 2. Determine whether there should be house account that all Salesmen can access in Global Setup for eContact Manager. A house account is usually a customer that doesn’t have a specific salesman and any salesman can go after the house account. As of this writing (05/12/05), the house account logic only applies to eContact Manager, eContact Processor and Export Processor. We plan to apply the House Account logic to A/R and COP as well. 3. The following flag is for Global eContact Manager. 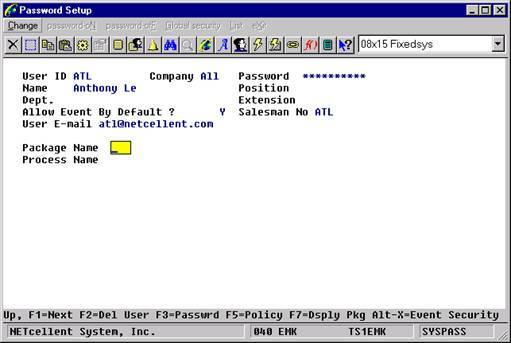 You need to determine if a particular salesman is subject to the Salesman Security in eContact manager. Export Processor (COP Files, except Ship-To). You need to determine whether the salesman is subject to salesman security in the above areas. We suggest you restrict the Salesman beyond these menu items. 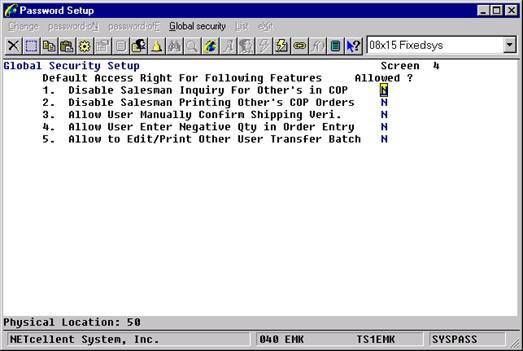 For example, if you wish to let Salesmen print reports for their own customers, you do not want to give them the “Order Status Reports” menu item since there is no salesman security in that area. 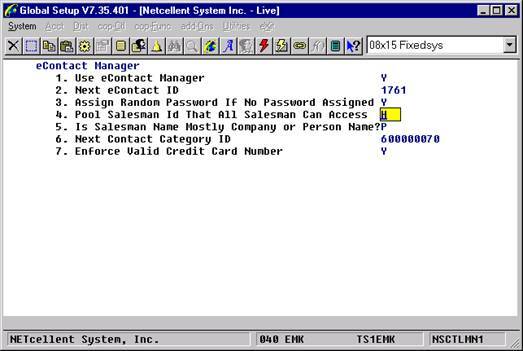 Instead, you might consider giving your salesmen access to “Export Processor” where salesman security is implemented. 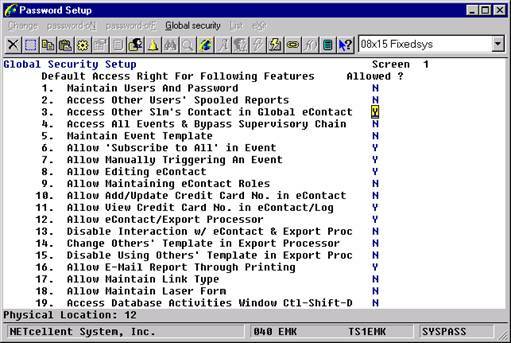 There is a separate flag for “Disable Interaction w/ eContact & Export Proc” because you may want certain people to use the “eContact/Export Processor” in batch mode without allowing them to use the interaction mode, where they can access more information. Is this user a salesman? Do you want to limit this user to access only those eContacts that he/she is a salesman? Will this user use Global eContact? Global eContact is like a Rolodex where you can have a list of contacts with information for their phone number, email, fax number, etc. Do you want this user to see all Contact information in Global eContact or would you like to limit the salesman to see only his/her contacts in Global eContact? Do you want to let this user view eContact information only without the ability to edit it? Do you want to let this user add and edit credit cards or view the credit card number? Typically, you may allow collecting of credit card information, but once the credit card is collected you do not want users to see the credit card number for security reasons. Do you allow this user to access eContact/Export Processor? 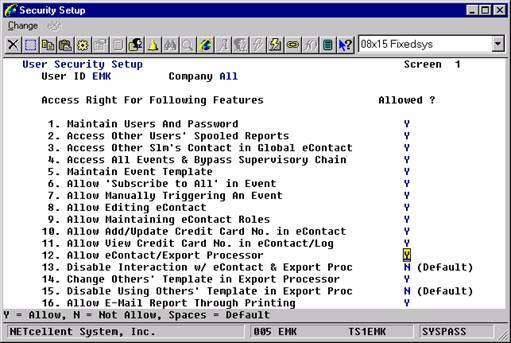 eContact/Export Processor is like a report writer where the user can access a lot of information in the Elliott system. You may consider giving the user access to pre-written reports without the ability to change it. This lowers the security concern. If you wish to implement this, then you will give users access to eContact/Export Processor, but disable the “Interaction” with eContact/Export Processor. If you decide to give users the ability to Interact with eContact/Export Processor, you need to decide whether this user use and view other people’s templates or not. If a user is allowed to Interact with eContact/Export processor, even though they may be prevented from using other’s templates, they can still create new templates or change their own template criteria. If this user is a supervisor (IT) and develops a template (pre-written report) for other users, you need to give this user the ability to change the template for other users. Global Security: “Disable Salesman from Viewing Other Customers in A/R”.